The suicide-blogger Martin Manley lists "reasons for what I've done." 4. Economic collapse is inevitable (see U.S Financial to the left). The United States’ annual debt and cumulative deficit is way beyond the “out of control” label usually associated with it. It’s spiraling into oblivion and it will take society with it. Today the deficit is $16.9 trillion dollars with another $125 trillion of unfunded liabilities such as social security, medicare, prescription drug and federal pensions. It’s hopeless. I felt pretty good about being prepared for economic collapse – the primary reason being all the gold and silver I owned. But, then one day I realized that all the gold and silver and guns and ammo and dried food and toilet paper in the world wouldn’t prevent me from seeing the calamity with my own eyes - either ignoring other's plight or succumbing to it. And, that’s something I decided I simply was not willing to live through. I do not advocate anyone take the same way out that I took – especially considering almost everyone has more identifiable reasons to extend their life than I did. But, if you plan to stick around, then you better plan to watch an economic collapse that will be worse than anything you can imagine. I was hoping that the link he provided for "U.S. Financial" would be analysis of US debt/deficit but it just goes to a link about why state lotteries are such a rip-off. His other link is to the U.S. National Debt Clock. I have to say, I'm surprised by his errors here. Based on reading his blog, I gather he cared about accuracy and was very much a numbers guy. And in spite of his feeling that he had no legacy, Manley could brag about one enduring accomplishment in the field of sports - a field I don't happen to care anything about, but which many people do: he created something called the NBA Efficiency Rating. But in spite of his hyper-numeracy, and although he clearly makes a distinction between "debt" and "deficit" in his statement, he claims that the deficit is $16.9 trillion dollars, when what he really means is the national debt. The deficit is $792 billion. What is the difference between the public debt and the deficit?The deficit is the difference between the money Government takes in, called receipts, and what the Government spends, called outlays, each year. Receipts include the money the Government takes in from income, excise and social insurance taxes as well as fees and other income. Outlays include all Federal spending including social security and Medicare benefits along with all other spending ranging from medical research to interest payments on the debt. When there is a deficit, Treasury must borrow the money needed for the government to pay its bills. Now we know that much of the current debt is the result of two unfunded wars and Bush's tax cut for the wealthy, as well as the financial meltdown of 2008 which required not only bank bail-outs but increased pay-outs for the greater number of people relying on unemployment and foodstamps to get by. 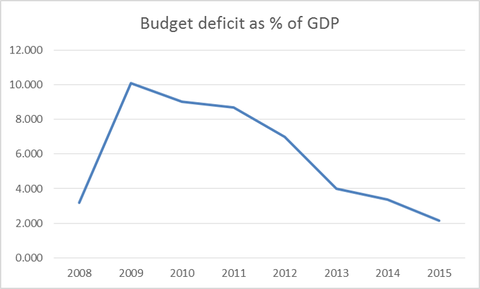 But much much more important than this confusion, is that contrary to Manley's belief that the deficit is "spiraling into oblivion" in fact the deficit is dropping. I made a screen recording of a few seconds of the Debt Clock and you can see that the item labeled "US FEDERAL BUDGET DEFICIT decreases from 792,745,227,903 down to 792,745,142,099. Hal Valarian of Google did a survey for Krugman and sure enough, contrary to reality, most people thought the deficit was increasing. Jonathan Chait finds Rand Paul talking about the evils of “running a trillion-dollar deficit every year” — which, as it happens, is not at all what we’re doing; the deficit is at around $600 billion and falling fast. This follows on Eric Cantor’s talk about “growing deficits”, when deficits are in fact shrinking. I think it’s pretty clear that Paul actually has no idea that the deficit is falling; it’s quite possible that neither does Cantor. The whole incident reminds me of 2011, when supposedly well-informed candidates like Tim Pawlenty went on about soaring government employment during a time of unprecedented cuts in the public payroll. Once you’re inside the closed conservative information loop, you know lots of things that aren’t so. Now you can argue that Republicans claiming that we are running a "trillion-dollar deficit every year" is pure incompetence rather than a deliberate effort to misinform, but either way, I think it's inarguable that they are responsible for spreading the misinformation that resulted in one of the factors that drove Martin Manley to suicide.